This long-awaited reference work marks the culmination of numerous years of research and international collaboration by the world's leading syntacticians. There exists no other comparable collection of research that documents the development of syntax in this way. Under the editorial direction of Martin Everaert and Henk van Riemsdijk, it comprises case studies commissioned specifically for this volume. The 80 contributors are drawn from an international group of prestigious linguists, including Joe Emonds, Sandra Chung, Susan Rothstein, Adriana Belletti, Jim Huang, Howard Lasnik, and Marcel den Dikken, among many others. A unique collection of newly-commissioned case studies, offering access to research completed over the last 40 years. Brings together the world's leading syntacticians to provide a large and diverse number of case studies in the field. 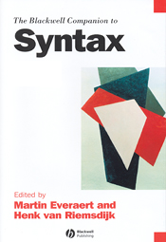 Explores a comprehensive range of syntax topics from an historical perspective. Investigates empirical domains which have been well-documented and which have played a prominent role in theoretical syntax at some stage in the development of generative grammar. Serves as a research tool for not only theoretical linguistics but also the various forms of applied linguistics. Contains an accessible alphabetical structure, with an index integral to each volume featuring keywords and key figures. Published within the prestigious Blackwell Handbooks in Linguistics series, this work can be relied upon to deliver the quality and expertise with which Blackwell Publishing's linguistics list is associated.